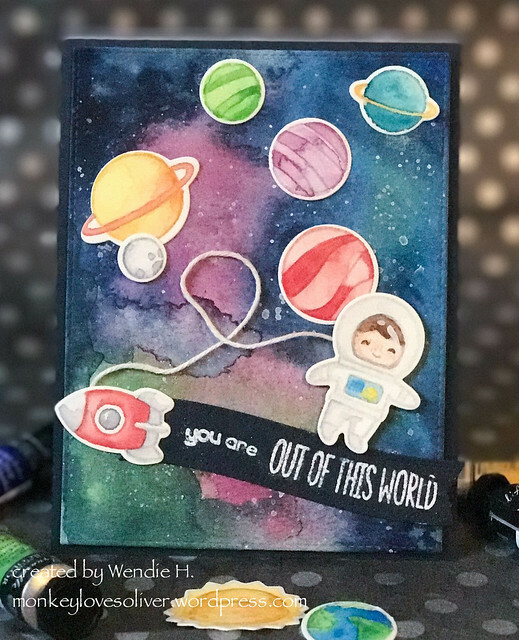 Hi friends, today I have a sweet card that I made for Father’s Day using Lawn Fawn’s Out of this World set. 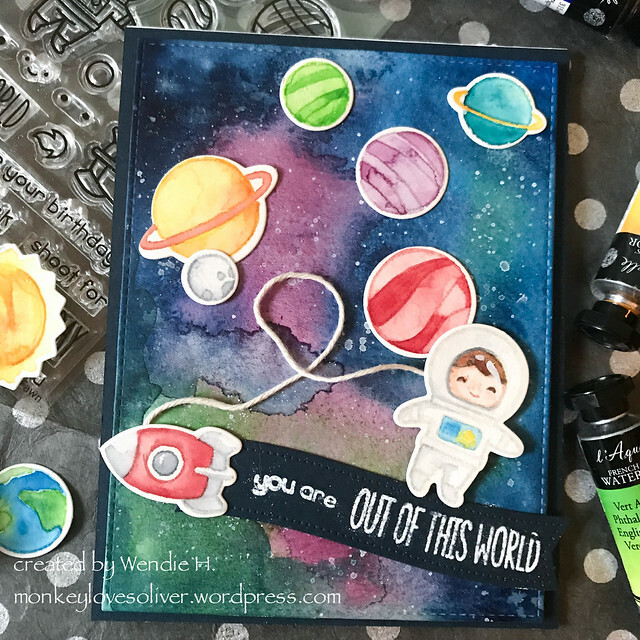 I was over the moon (hee hee) when I first saw this set – that little astronaut! the wee rocket! the adorable planets! I knew this would be a well loved and often used set in my collection. Father’s Day gift lists are often filled with golf and BBQ, neither of which are high on my dad’s list. Give him tools and puns, and throw in some sci-fi for good measure. And maybe a cat or two. So I wanted to make him a card that was more suited to his personality. Starting with the background panel, I took a piece of watercolor paper and brushed it with lots of water. Lots of water. Then I used a variety of blue, purple, green and yellow watercolor paints (primarily from Sennelier, though the deepest blue is from my Gansai Tambi set) and randomly dropped them on the paper. All that water on the paper really helps the paint move around. I let it dry after the first layer and then started again to really get that depth in the color. I used my deepest blue to finish it off. Using a heat tool can create some neat effects with the paint as it moves around and concentrates with the heat. Once it was all dry, I loaded a small brush (maybe a 4 round) with wet white paint and splattered the paint across the paper. While that was all drying, I worked on the rest of the scene. I stamped each image onto another piece of water paper using a light grey ink and painted them with watercolors. Then I die cut them, arranged them a few times until I settled on something I liked, and then adhered them to the dried and trimmed background panel. I also embossed a sentiment from the set onto a strip of midnight blue cardstock. I used some string to attach the astronaut to his rocket. Dad loved it (he better) and texted me with some choice space puns. Dads, right?